Arsenal striker Pierre-Emerick Aubameyang and Manchester City’s England winger Raheem Sterling have both been subjected to racism this season with fans of a number of clubs, most notably Chelsea, among those cited for verbal abuse. British Sports Minister Mims Davies will meet in the coming weeks with representatives of the Football Association (FA), Premier League and English Football League (EFL) to address the issues, the Department for Digital, Culture, Media and Sport said in a statement. 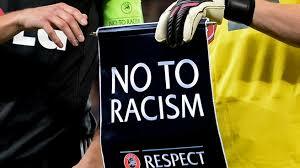 Campaign groups such as Kick It Out will also be invited to discuss what more football can do to stamp out racist, homophobic and anti-Semitic abuse at matches. “Football is the national game. People of all ages and from all backgrounds should be able to enjoy it. It should bring people together not foster division,” said Davies.